My mother still uses a camera with film, the kind that needs to be developed. 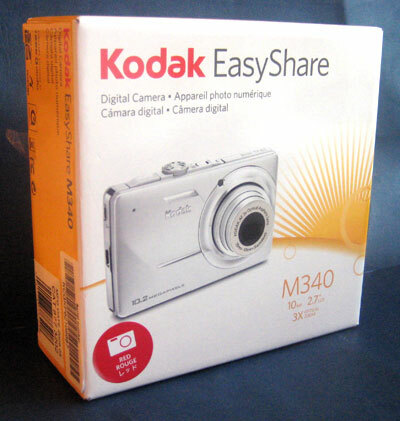 When I won a Kodak M340 EasyShare camera at the BlogHer conference this year, I gave it to her, hoping she’d learn how to use the new gadget. Four months later, I saw the camera on her bookshelf, still in the unopened box. Every book purchase counts as one entry. You can make as many purchases as you want. Please note, you need to buy a new copy from a bookstore or online shop, not a used copy. You already have a copy? That’s great! Buy one for a friend! You don’t want to do that because they’ll think you’re calling them fat? That’s ok, just send me a self-addressed, stamped envelope along with your entry and I’ll send you a notecard to insert into the book letting your friend know you don’t think they’re fat. In February, I’ll randomly choose the winner of a nice, new, shiny camera. Good luck! That’s ok, just send me a self-addressed, stamped envelope along with your entry and I’ll send you a notecard to insert into the book letting your friend know you don’t think they’re fat. Hehe, this made me laugh!! I’m actually with your mom on this one – I’ll keep using my old-school camera until the stores stop developing the film. It’s nice to know that I’m not the last one out there! my father still uses a film camera. he is back at mailing the film off to someone….i dread the day he no longer can….he doesn’t understand the www he says. Awesome giveaway. I LOVE the idea that you’ll include the “You’re not fat” note. I bought your book last Feb! And I have a camera…so I’ll let others be the lucky ones (and I think I’ve even lent my copy of your book out, come to think of it). Brilliant! What a great way to sell books!! I know people who still use “film” cameras too. I guess you can put them in the same category as people who still buy cd’s in the record store. Does it count if I bought it the Wednesday, right before Thanksgiving and read it front to end by Friday? I loooved your book and it was easier to relate to you than some of the other weight-loss memoirs I’ve read, possibly because you are fellow dork around my age. I might be one of the few females that read your book that smiled at the random game references. Also, I’ve actually lost about 50lbs so far and I’ve been stuck between 210-220 for over a year now! Its driving me crazy! What can’t be helping is that I’m eating a bag of Fritos while writing this comment because I convince myself that exam week is a valid excuse for junk food. However, I don’t see how I will make it through a night of quantum physics without some Swedish Fish…. I really want to buy one for my niece, but she is very overweight (I’m guessing 300 lbs.) and I know she’ll know. What to do, what to do? Does a kindle edition of the book count? @Susan Dean – Yeah, the Kindle version counts. I actually found your Web site after buying your book on my Kindle (bought it a week before Thanksgiving, oh well!). I just wanted to say thank you for writing it. I have read it and will probably finish reading it a second time before January. Thank you.